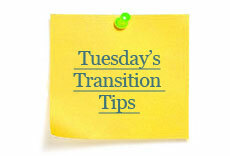 Tuesday's Transition Tips for Teachers is a weekly email for teachers, administrators, parents, counselors, and vocational rehabilitation staff. "Tip" topics include quality and compliant Transition IEPs, transition assessments, drop-out prevention strategies, work-based learning, academic and life skill instruction, family involvement, working with Vocational Rehabilitation Services and much, much more. One of several new changes Indiana is implementing for all students receiving special education services is the transition portfolio. A portfolio is a collection of information and materials related to a student’s academic and work-related activities. The new portfolios will help students share their learning characteristics, academic skills, and employability skills with postsecondary training programs or potential employers. Last week the Indiana Department of Education’s Office of Special Education announced that it has published “Transition Portfolio Guidance” for the state’s secondary teachers. This summer, the Office of Special Education will also be providing Transition Portfolio Regional Trainings for special education teachers, administrators, and counselors. For more information and to register for trainings in Fort Wayne, South Bend, Washington, Fishers, or Seymour, see the Transition Portfolio Regional Trainings flyer. And one more heads up. We’re thisclose to publishing an updated version of Indiana Diploma Decisions for students, families, and teachers. Stay tuned to your Tuesday Tips!